Last weekend the sounds of battle and explosions were coming from Australian capital Canberra! With many brave soldiers' fates being decided by the fickle whim of Lady Luck and the plastic dice cubes that Fate seems to love so much! 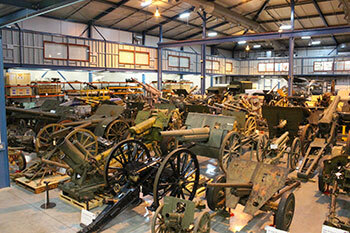 Every Australia Day long weekend, the annual wargaming convention CANCON is held at the Exhibition Park in Canberra. 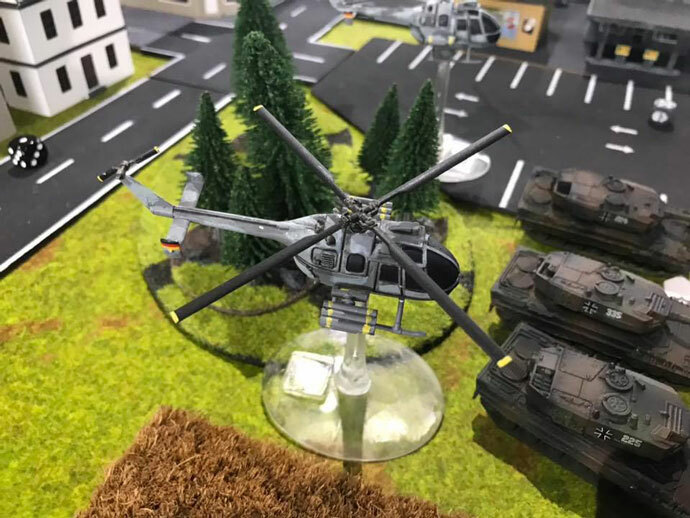 This is the biggest tournament in the Australian Wargaming calendar and thousands of wargamers from all systems come together for 3 days of gaming and fun! 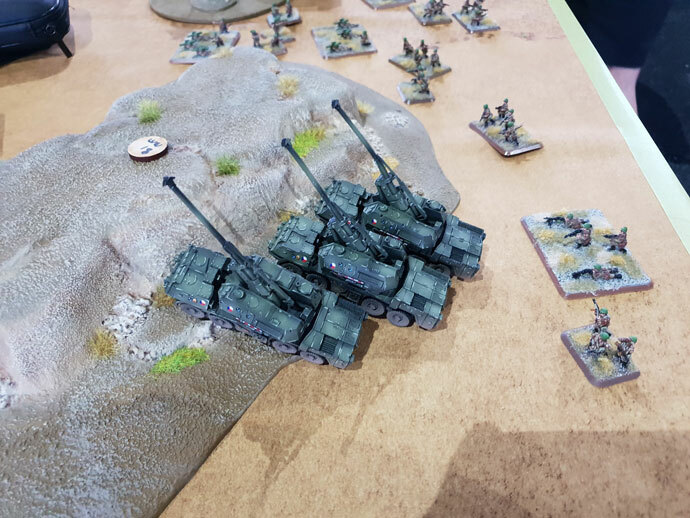 This year we had the Australian Nationals for Flames of War and Team Yankee at CANCON again, with a Flames of War V4 Mid War event and a Team Yankee event. I put my hand up to run both of the events. Players from all over Australia and also some international players, with Sofia Chambers coming from New Zealand, and Ben Lin (Blitz and Peaces) and Lance Chong Yu An from Singapore, coming the long way to have some fun! We even had a special guest, with Chris Townley from the Battlefront Studio coming over to meet the players and help run the Team Yankee event. The V4 Mid War Tournament was a two-day 110 point event, consisting of 6 games in total, and 3 games per day. To make this a bit different, 10 points had to be spent on Command Cards. This was to allow players the opportunity to experiment with them without feeling like they were taking away from the troops they would usually put on the table. The event saw a mix of newer players trying their hand at a tournament, and grizzled veterans eager to see how the new rules would change their tournament experience. There was a good mix of Germans, Soviets, Italians, British and Americans, with Ferdinands taking on Tigers, and Semoventes taking on T-34s. I remember one memorable game where I killed my own Tiger by driving over my own minefields ( I can pass a 3+ save twice, then roll higher than a 2!!?? ...... right!) then my last two infantry teams strapping on their big boy pants and some panzerknackers and taking out two Ferdinands!! I’m sure there were many more memorable moments from the other players. 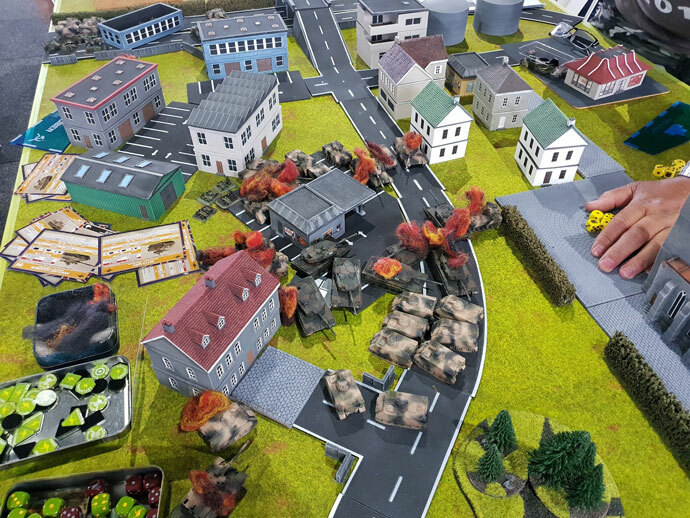 From all accounts both the more experienced players and the first timers had a great time, and enjoyed the wonderful tables, well painted armies and meeting and playing against some new opponents. Despite it being a competition, everyone seemed fairly relaxed and laid back, and any rules queries were quickly resolved. Even playing in the heat of some very hot days, 39°C on the first day, and almost as hot on the second, did not get tempers fraying. At the end of 2 days of hard fought gaming, and many dice rolled with luck both good and bad we had a result. A complete list of the players and their placing is below. On the third day of the event, we had a Mega Battle, The Third Battle of Kharkov, with the Germans trying to take back the city from the Soviets. Historically this was the last successful German Offensive of WW2, with Field Marshal Von Manstein cutting off and defeating the overextended Soviet spearhead forces and then using the tactics of elastic defence, to strike back once the enemy had exhausted itself. 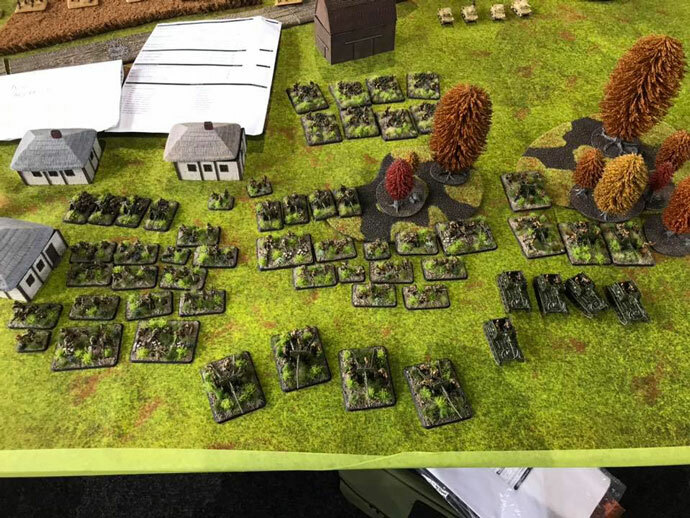 We recreated this over 4 tables in a U shape, with 500 points per side, with the Germans starting by encircling the Soviet spearhead and then having to make their way to Kharkov, through the Soviet reinforcements to take Kharkov. 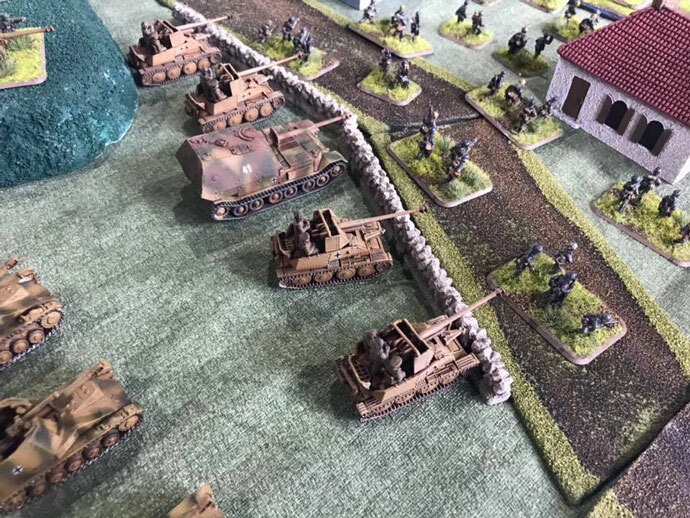 Unfortunately, the Germans could not pull of Von Mansteins Slap again, they managed to crush the spearhead, but could not staunch the flow of reinforcements coming from Kharkov. In the end it was a stalemate, but an excellent game and something different for the players who attended. The Team Yankee Tournament was a two day 85 point event, also consisting of 6 games in total and 3 games per day. Again this was a mix of both grizzled veterans and tournament virgins, but all of the players had a great time, with some wonderfully painted armies and some excellent generalship that resulted in some high quality games. There was a good mix of Red and Blue Forces, with West German, American, British, French, Aussie, Soviet, Polish and Czech, and even the Forces of Dear Leader. We even had a game with 5 West German Leopard 2’s fighting off a horde of Australian Leopard 1’s and almost coming out on top! With the HQ passing last stand after last stand to keep fighting off the angry Aussies! We had some very nice looking Czech and Polish Forces, with their wonderful new artillery, and even some forces from the Dear Leader himself, with a North Korean themed force! Overall the standard of both the gaming and painting was excellent, truly a wonderful sight with many well painted forces! The heat and competition was not enough to get tempers fraying and all players had some hard fought but fun games. We eventually had some winners! I would like to give a special thanks to Battlefront, Aetherworks and Dice of War as sponsors of this event, and their great support and in helping to make this an event that all the players enjoyed. Also to Chris Townley for coming over and braving the Australian summer and helping me run the event, without his help it would not have gone as smoothly as it did. He also made himself available to all the players and answered all their questions, also giving us a heads up to the plans of the studio this year. Late war will be out soon and it sounds fantastic!! I would say this time next year we will be just finishing some excellent late war action, if it is anywhere near as good as it sounds. So, if you can make it for CANCON 2020, we can make it even bigger and better than this years, and have a blast making some new friends! Hope to see you next year for CANCON! It has been 18 years since I made the pilgrimage to CANCON – I use that term as it is a massive event, not just by comparison to other events in New Zealand or Australian, but by global standards – and I was really excited to make the trip. Driving down to Canberra on the Friday afternoon I was lucky enough to make it to the Australian War Museum Annex Tour (big thanks to Ken Snell for organising this, it was a once-in-a-lifetime experience) where we got to have a look behind the scenes at a massive array of equipment that is otherwise not on display. This also gave me a chance to meet some of the people I’ve been trading emails with over the past years. 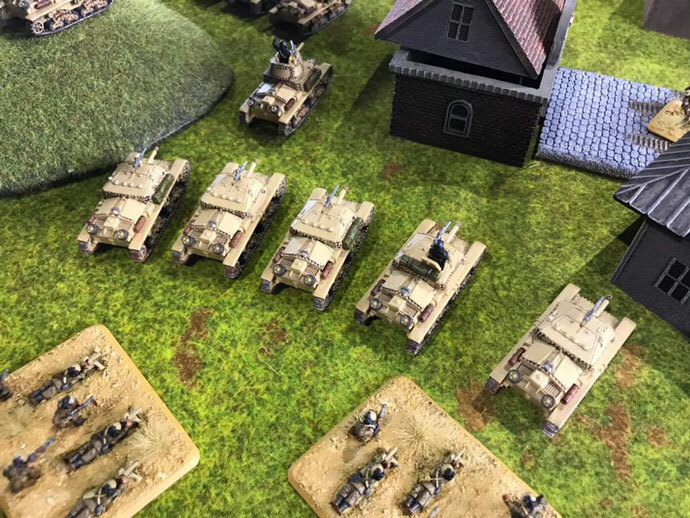 As Adam said, the Saturday and Sunday were filled with gamers enjoying their weekend and I had a chance to look around the three halls, checking out not just the Flames Of War and Team Yankee action but all the other games and stands as well. The event has certainly grown significantly in the past two decades. Everyone that I met, even those that I had met before and were having trouble placing their faces (David Rea, I’m looking a you) were incredibly welcoming and made this travelling kiwi feel like part of the family. This certainly made the trip one of favourite wargaming excursions. In addition to spending time with many of the gamers, I had a chance to visit (and chat with) Luis of Jolt Games, Matt from Hall of Heroes and of course Paul and the rest of the Aetherworks team (our distributors in Australia). I love exploring stores for the first time, checking out their gaming tables and products. Store owners like Luis and Matt also get to speak to such a wide variety of gamers that their insight is always invaluable when it comes to understanding the needs of the local community. Heading back to NZ I found myself counting down the days till the next CANCON and hoping I would have the opportunity to come back and catch up with so many great people.